Established in 1980, Siam Park City is an amusement park and water park located on Seri Thai Road and Khan Na Yao District on 300 acres. It has the biggest artificial sea in the world. Moreover, the park has a spa, multiple swimming pools and a 7-storey waterslide. 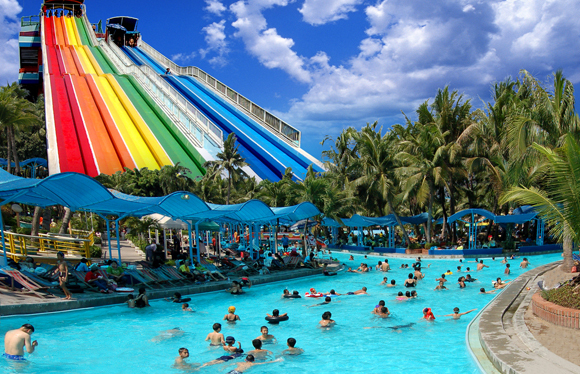 Siam Park is separated into three main zones, the water park, the amusement park and a theme park (Siam Genius). The amusement park is then separated into 4 sub zones. Fantasy World, X-zone, Family world and Small World. Welcome to the largest waterpark in Asia! Chill out under tropical coconut tree shade and spend a quality time with your family and loved ones. Have fun at our Flowing Pool and the new aquatic zone; Si-Am Lagoon, a perfect ride for family members of all ages. Enjoy time at the World’s Largest Wave Pool certified by Guinness World Records. Test your limits at our signature water rides, Speed Slide and Super Spiral. Relax on the beach chair and get a recreational treat at the Spa Club. Make your holiday worthwhile! The park offers something for everyone of all ages. The park also contains the Pathfinder camp which is used for scout groups, a huge amphitheater that regularly puts on shows from America, Russia, England and China, and a shelter all located inside the park.